On Tuesday, Apple filed its response to Samsung's appeal of the preliminary injunction that Judge Lucy Koh had placed on the Samsung GALAXY Nexus. A temporary stay has been extended on the injunction by the appeals court. Included in the filing is a couple of interesting graphs. 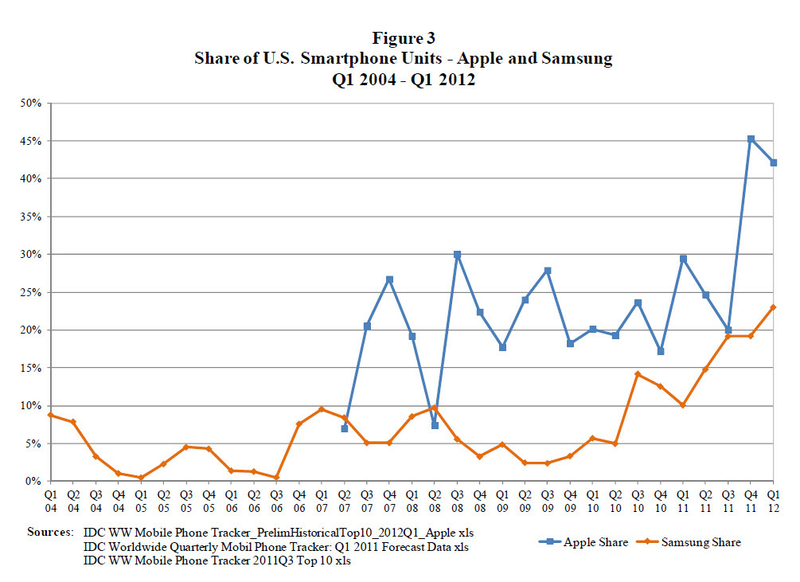 One shows the U.S. smartphone market share of both Apple and Samsung from Q1 if 2004 through Q1 of 2012. 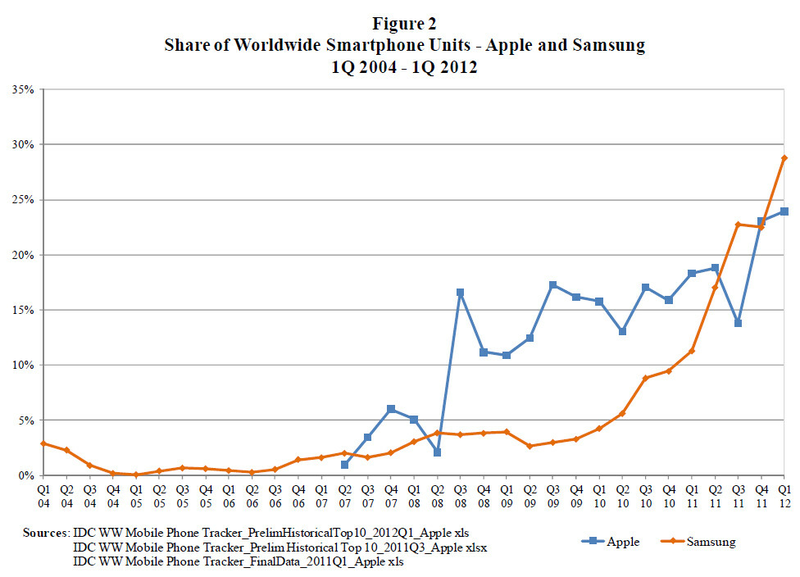 What is interesting about this graph is that Apple's market share does fluctuate. There were times, like in the second quarter of 2008 and the third quarter of last year, when both firms had nearly an equal share of the U.S. smartphone market. The second quarter of 2008 was when Sprint was pushing the 3G Samsung Instinct as an "iPhone Killer". This was when the OG Apple iPhone was running on EDGE. It was also just prior to the launch of the Apple iPhone 3G which would also account for the dip in Apple's market share at the time. That would also explain the drop in market share in the third quarter of 2011 as consumers awaited what would be the Apple iPhone 4S. The last graph shows worldwide unit sales of smartphones during the same period. 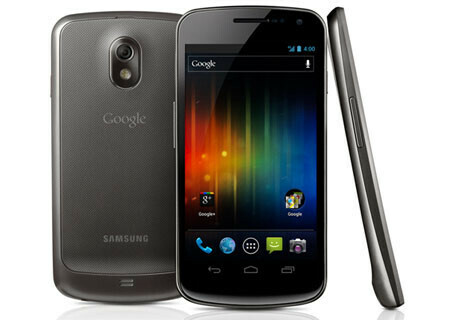 In the last two quarters, Samsung has topped Apple in worldwide sales of smartphones based on units. The charts are based on data from IDC and does not include the most recent quarter that showed the Korean manufacturer nearly doubling the number of iPhones sold by Apple in the period. In today's opening statement at the District Court showdown between Apple and Samsung, the former once again pointed out Samsung's increasing market share, most likely to show how Apple has been harmed by Samsung's alleged patent infringement. I knew when I read the title it would be in Apple's favor. Apple is just stating the facts. There's no normative spin on these statistic. This complete spin! Apple just said after their earnings call that the drop was because anticipation of the next iPhone. They cannot have it both ways. They are either slipping because Samsung is kicking their arse or because people are holding off or the next phone. Also is it me or is this the same thing that people have been praising Apple for doing. They take something that is already there and make it better, they refine it, maybe even make it innovative. I used the word "normative" as a descriptive before "spin". I understand most people don't know what normative means or how it is used. normative is defined as "of or pertaining to a norm, especially an assumed norm regarded as the standard of correctness in behavior, speech, writing, etc." 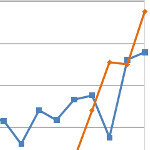 source:http://dictionary.reference.com/browse/normative Apple is in fact making a very strong case that Samsung sucked in the smartphone marketplace for a long time and then did great after the introduction of the iPhone. I am saying you don't have to agree with Apple's assertion because in statistics, we are taught correlation is not causation or casuality. Nonetheless, you have to wonder how Samsung did so well after stealing Apple's IP. That is why this case is very interesting. Nobody has stole Apple's IP lmao. Keep dreaming. I think Apple wants to go bigger screen and thinner phone. They dont wanna be seen as copy cats. Or they mad cuz they cant hype it up as the next great things in mobile phones. Ah yes statistics from Apple. You can always smell bulls**t.
Apple filed lawsuits only on Samsung not other phone makers, Judge Koh must be too busy playing with iPhone and iPad and no time to do on research on other phone makers that copied from iPhone and iPad. khmer , If you are going to slam Apple, you really have to put some effort into it. That was W-E-A-K, even by android fanboy standards. Dude I don't know what you're smoking, but please stop smoking it. > What harmed Apple's market share was their refusal to even attempt to out innovate the competition That is an another prototypical android fanboy witchhunt. The fact is Apple has been awarded key patents in the smartphone arena, thus providing the evidence Apple is trying to out-innovate the competition. I would like to see Google's patent applications from 2004 to 2007 timeframe to discern what plans they had in mind for android. Take a good look at Apple's key patents. They are littered with prior art, stolen ideas and just plain idiotic slip by. That's not innovation. Apple's business plan seems to be to take advantage of a serverely screwed up patent system, to submit any idea that comes to mind without actually working on it, then use that to drive all competition or of the game. Then be absurd enough to try to claim a tap is a zero length swipe, so taps infringe your patent. Software patents need to be abolished. Period. If this system existed 30 years ago, we'd have had a patent on "a system of low level code to interface between a user and a device," and we'd all have had to use one operating system for the next twenty years. So the "slide to unlock" patent that they love to sue over is an example of their innivation? Maybe we should wait til they can actually get a 4g radio in a phone and then we'll applaud their innovation. Patent trolling isn't innovating anything. Apple and Samsung trials make the Samsung consumers rushing to buy Galaxy S3 before it is ban from America, I owned Galaxy S3 love it so much, I keep it in my pocket all the time even at home. Samsung is on the rise every year but apple jumps up and down because the sales of their products changes but Samsung sales rise slowly and steady,maybe that's why apple so scared or worried so apple is doing everything to stop Samsung. How can Apple claimed to be harmed....when the iPhone has outsold each previous version....set sales records on Verizon, AT&T and Sprint??? He may be pro-Apple or write with a pro-Apple spin, however FACTS are FACTS. He's just reporting the facts from publicly filed documents with the court. I am a fact-checker and I am just sharing the source where I got the facts. Facts can be easily made to look a certain way depending on the writer... You just have to go through various sites and see how one person will spin a fact to be pro apple and then another site using the same fact making look anti apple for example... Not nothing against you mate just I personally don't read anything from Foss knowing how blatant bias they have towards apple. "and in an ideal scenario for Cupertino, Samsung will then realize that it can't win, and back down." This is simple bias, no facts involved just wishful thinking. The fact is that Florian Meuller had been licking Apple's boots for years, and he is dead wrong as often as he is right. You could literally flip a coin and get the outcomes of these cases right as often as he. He was predicting a huge loss for Google, versus Oracle. Ask him what he thought of Samsung v. Apple I the UK. Getting facts about any Apple vs Anyone court case from FOSSPatents is like getting facts on the Jewish people from the Third Reich. Even if theft were a fact (and its far from a fact), loss of sales still can't be proved. Even if Samsung had dropped out of the smartphone game all together, I still would not have gotten an iPhone. I'd have gone WinMo again if that was the only other choice. The problem here is Apple feels that basic geometric shapes, colors and patterns are IP. The sane world doesn't see it that way.